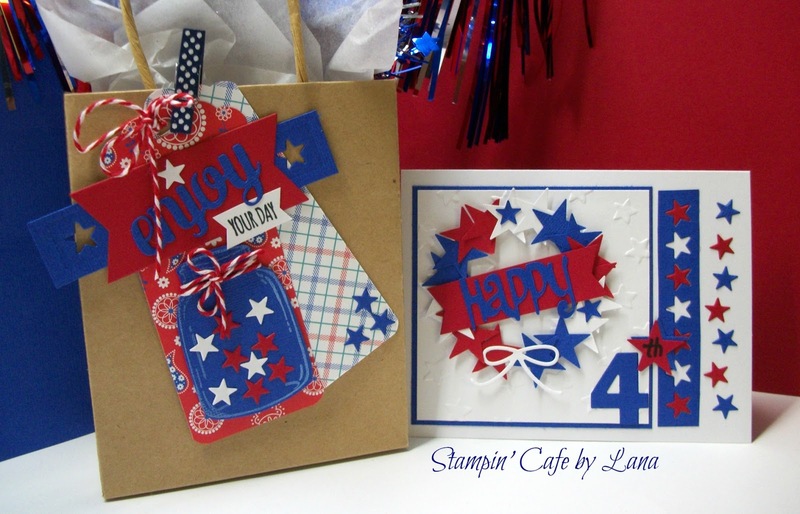 Here is a "Happy 4th" Card and gift tag for the Fourth of July! For the card, I formed a wreath with various punched out stars, added a bow and a banner with the word "Happy (cut from a Cricut cartridge). The wreath is attached with dimensionals to a piece of cardstock embossed with stars and matted on a coordinating blue piece of cardstock. 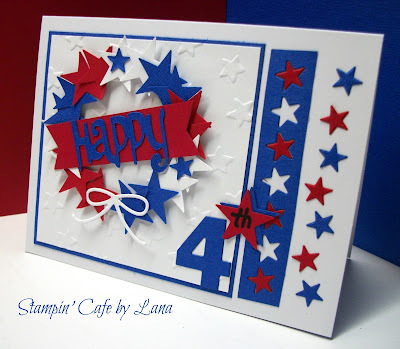 I added more stars along the righthand side of the card and die cut the #4. 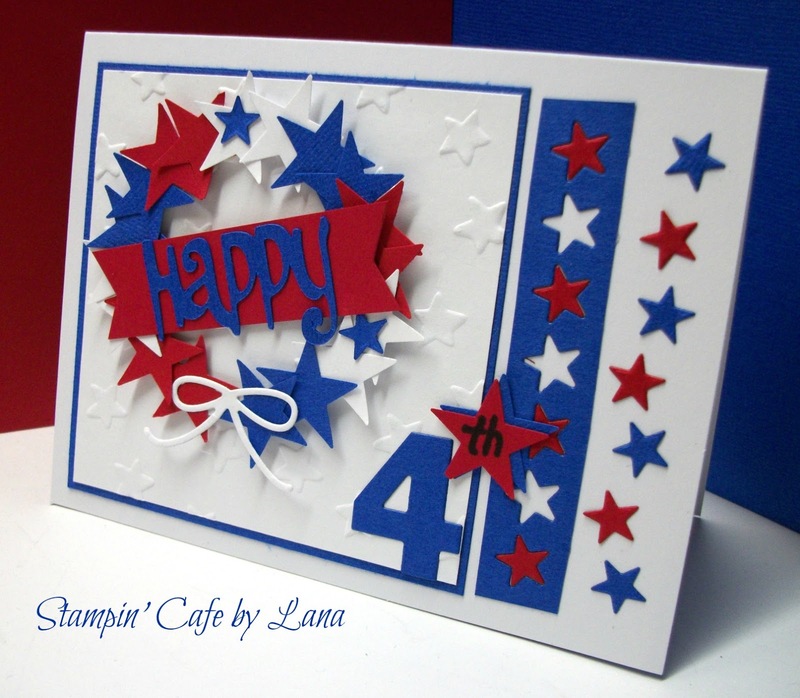 Finished card is 5-1/2 x 4-1/4 inches. My granddaughter is only 3-1/2, so I made her a little goodie bag with things I found at Dollar Tree. I made a tag for the bag by layering two tags together in red, white and blue papers, added a blue Mason jar filled with stars, and then tied some red and white baker's twine around the jar. It is attached to the tags with dimensionals, along with the blue star punched out piece and the red banner with the die-cut word "enjoy." 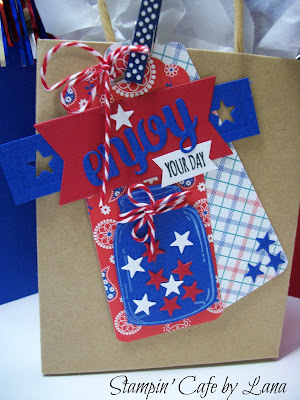 I stamped "your day" and banner cut it to attach below "enjoy." I grouped some blue punched out stars in the bottom righthand corner and attached the entire tag to my bag with a blue polka dot clothespin. Most papers are from my stash, but specifically the red cardstock is from Stampin' Up, along with the dies from the "Mini-Treat Bag Thinlets," and a retired Mason jar stamp that I stamped in white pigment ink, and then hand cut. "Your Day" is from the "You're So Sweet" stamp set that coordinates with the "Mini-Treat Bag Thinlets". I also used various sized star punches and the Scalloped Tag Topper punch. I hope you have a safe and fun Fourth of July weekend!